There is no greater component containing moving parts in your vehicle. The last thing you want to hear is that your transmission needs repairs. Typical symptoms may include: Irregular shifting patterns, slipping, stalling, fluid leaking, or the service engine soon light may come on. Are you concerned that you may be experiencing problems with your vehicle? Our ASE Certified auto repair experts in Mechanicsburg, PA 17050 know how to fix the problem. We will diagnose the problem and help you make an educated decision on what is best for your vehicle. Automatic & Manual Transmission Repair. Don’t hesitate to Contact Us to schedule an appointment. We are proud to serve everyone in Mechanicsburg, Camp Hill, Harrisburg, Carlisle, and all of Central PA! Always change the ATF fluid when suggested by your vehicle’s manufacturer. This will prolong the life of your transmissions internal components, and prevent costly repairs. Contact Us for more details. Don’t wait till it’s sweltering outside to ensure your car or trucks air conditioning is working properly. Let our ASE certified experts at Hampden Automotive ensure your vehicles air conditioning system is charged with refrigerant and free of leaks. Give us a call or stop by for your FREE A/C Check. No purchase necessary. How do I know if my vehicle needs serviced? If you aren’t sure when your vehicle is due for routine maintenance. We can provide you with a routine maintenance guide tailored to your vehicles needs. We service all makes and models of vehicles. From Oil changes, New Tires, Inspections, Brake Repair to Engine Repair and Transmission Repair. 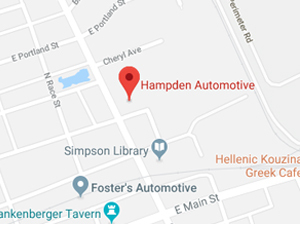 Hampden Automotive is your complete car care center. Place a penny head first into several tread grooves across the tire. If you always see the top of Lincoln’s head, your treads are shallow and worn. In this is the case, your tires need replaced. If part of Lincoln’s head is always covered by the tread, you have more than 2/32 of an inch of tread depth remaining. Should I be using Synthetic Oil? Synthetic oil takes longer to break down. It should last for 4,000 to 6,000 miles or more between oil changes. Conventional oil should generally changed every 3,000 miles. It may be a benefit to your vehicle. But always consult your owners manual first, or Contact Us ask us for more information.